Coordinate your financial activities. We regularly coordinate insurance and financial activities for clients with the other members of their team of financial, tax and legal advisors*. We can do the same for you. Monitor progress; provide ongoing service as your needs and situation change over time. This is not a one-shot deal. Strategies need to be adjusted periodically as your life and the economy changes. We will work with you over the years to help keep your program on track with your changing needs. 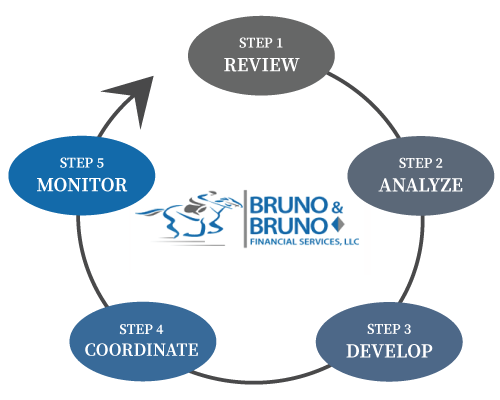 *Neither Bruno & Bruno Financial Services, LLC nor its staff nor NYLIFE Securities LLC or its agents tax, legal, or accounting advice. Please consult your own tax, legal and accounting professionals before making any decisions.